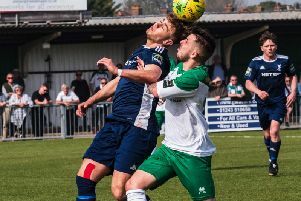 Former Bognor coach Darin Killpartrick has paid tribute to a lifelong Rocks fans who has died suddenly. Season ticket holder Bill Spriggs passed away on Saturday evening at home after watching his beloved Bognor earn a 2-2 draw at Bracknell Town in the FA Trophy. Killpartrick said he was shocked at Bill's death and added: "He was a kind-hearted man and a big supporter. We'd often have lovely chats about the side and the game in general. He was a football man, no question, but more than that he was a proper gentleman and I know I speak for many when I say he will be sadly missed." Club secretary Simon Cook echoed the tributes being paid to Bill and confirmed the club would hold a minute's silence in his memory before the home match against Wingate & Finchley on November 17, with members of the Spriggs family in attendance. He said: "We've so saddened to hear of the sudden passing of huge Rocks fan Bill. The club would like to extend our deep sympathies to his family. He will be missed." His love for the Rocks and football came through In a statement issued by the family: "Bill Spriggs was a proud supporter of the Rocks. His passion for football was inspired by his own dad who was a very talented goalkeeper. "His parents moved from London to Bognor in the 1940s and thatʼs when his dad became a Bognor Rocks fan himself. Bill soon joined his dad at the matches and thatʼs when his love for the Rocks began. "Like his own dad, Bill has influenced his own family and especially his grandchildren and they have loved watching the g+mes over years with him. Bill continued his love for the game by managing his own youth side with Felpham Colts. "He managed the team right through from under 10s to under 18s. He inspired so many of the boys who still have so many fond memories of him to this day. Bill has been a dedicated fan and has watched the Rocks through their ups and downs. His funny banter has kept his fellow fans in the stand entertained along the way.